The CheckLight measures head movement and indicates when a jolt warrants medical attention. Many parents and coaches watch their young athletes like a hawk, yet often don’t know when a knock to the head requires more serious attention. Now they have a clever new tool to help them. 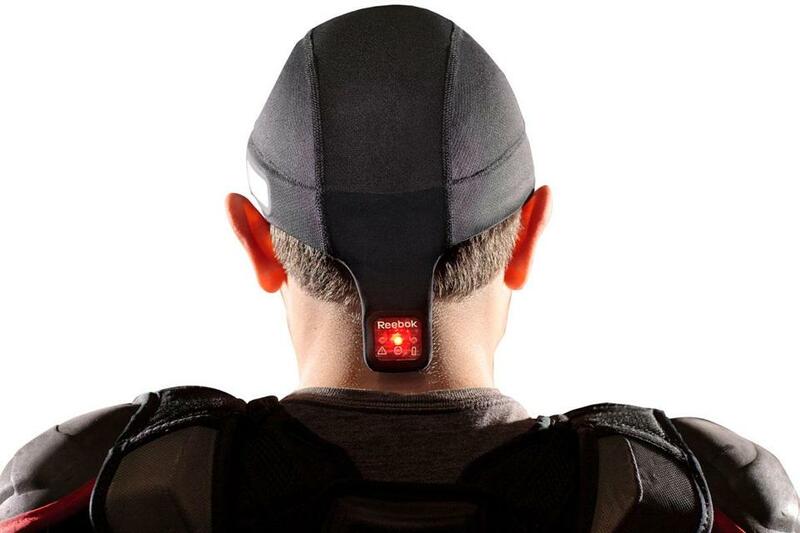 Reebok and the Cambridge technology company MC10 Inc. have released a device, called CheckLight, that measures the movement of an athlete’s head and indicates when a jolt is severe enough to warrant medical attention. The simple system includes a body sensor inside a skullcap, with a small screen that lights up on impact: yellow for a moderate blow, red for more severe. The device is MC10’s first commercial product and one of many new tools to track head blows as the sports and medical worlds learn more about the debilitating effects of concussions. Robert Cantu, codirector of the Center for the Study of Traumatic Encephalopathy at Boston University School of Medicine, said studies have discovered that high school and college football players, in particular, suffer an average of more than 800 powerful blows to the head in a given season. Meanwhile, medical experts fear that many concussions, which can lead to brain trauma, go undiagnosed. The device does not measure the exact force of each hit. But at $149.99, Cantu said, CheckLight is more affordable than other high-tech options on the market and will be used more often. Other new tools include a similar sensor system from Battle Sports Science of Omaha, in which the measuring device is part of the chin strap of a sports helmet. And Xenith LLC, of Lowell, is making a shock-absorbing football helmet. CheckLight, meanwhile, snugs up directly to the head through the spandex and lycra skullcap. Its sensors measure both the linear and rotational forces of the head’s movement, while an LED indicator at the base of the neck signals the severity of the hit. The alerts are based on standards developed by the National Transportation Safety Board for determining the potential injury from a head impact. Both companies were careful to point out that CheckLight is not a diagnostic tool, but rather an extra set of eyes on the field that look out for an athlete’s safety. A yellow or red light simply means the individual needs to be checked, said Paul Davis, Reebok International Ltd.’s director of advanced concepts. But the nature of the device carries wider implications in a sports world dominated by a competitive culture that pushes athletes to play through pain. A flashing red light will be hard to miss by other athletes or sports officials. It also removes the athlete’s judgment from the scenario and should trigger a request by referees or other officials to head off the field, said Isaiah Kacyvenski, the director of MC10’s sports segment and a former professional football player. Kacyvenski said tests of CheckLight on younger football players found many were making less contact with their head in order not to trigger a red light. “Kids didn’t want to be taken out of the game, so they avoided that light,” he said.